Hello friends! Today i will be unveiling a really cool blogspot widget that lets you display all the post on your blog in a random way. It helps increase user clicks and page views. It shows only in the homepage and will be hidden on postpages. The Blogger Responsive Random Post Slider display dymatically and shows perfectly around all screen sizes from mobile devices to laptops and even bigger screens. It doesn’t reduce the speed of your blog because it is really fast loading and beautiful. 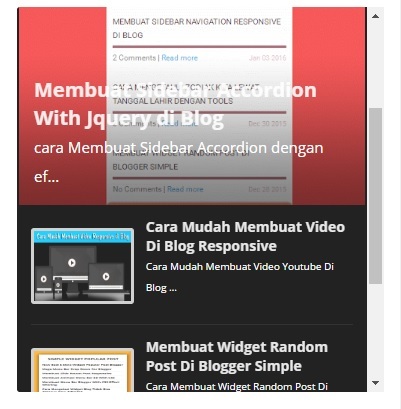 Lets get started with installing the random post slider into our blogspot blog. The codes and process is quite simple for pro bloggers but for new bies sake, i will keep it really easy and well explained. Visit ‘blogger.com‘ and locate the ‘Template’ section.In the template section, clink on ‘Edit HTML’. Once you find the </head> tag, copy and paste the below codes, right above it. When you find the </body> tag, copy and paste the above codes, right above it and clink on save to save the changes. Now is to add the final code, which will help us determine where the widget is to be shown. The pictures are properties of Obhiaba Blog, the Indonesian words you see, are posts from a test blog. Just a suggestion, if you use picture from other blog please cite the source. I saw those pictures are taken from Indonesian blogger.